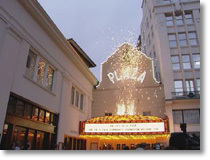 Jeffrey Mills covered the grand opening of the restored Interstate Plaza Theatre in El Paso on March 16th and 17th. The first evening included the christening of the new theatre marquee, an event crowned with a fireworks display and the lighting of the neon and light bulb entrance that was lovingly recreated to match the original 1929 theatre. The next day marked the official grand opening and included a parade through town of limos led by Betty MacGuire, the major benefactor whose contribution saved the theatre from the wrecking ball. Ms MacGuire helped cut the ribbon opening the theatre to its first show, Riverdance, that was premiering on this fitting holiday evening of St. Patrick's Day.